Now, let's look again at the attempt to get a few photons from Pluto. We saw that the camera was indeed pointed near Pluto and so, yes, a few photons from Pluto showed up in the image, but the signal to noise ratio was just too low to let us see anything. We know too that the poor tracking performance resulted in any photons from Pluto and other objects being spread out over too many camera pixels to be seen. So, I wanted to just go over once again my back of the envelope calculations that led me to believe that I should be able to get a glimpse of dim, magnitude 14.2 Pluto with just my 150-600 mm telephoto lens, which only has an aperture of about 95mm. My initial line of argument goes like this. A 1/4 second exposure measurement of Betelgeuse at Borrgeo Springs showed the value of all pixels associated with that star to be 945,688 ADU's. Betelgeuse is so bright, even at only 0.4 magnitude, that the pixels were still saturated and so the ADU count should have been even larger. Now a dim star in the image only had 2374 ADU's and so was 2.5 * log (945,688/2374) =at least 6.5 magnitude dimmer than Betelgeuse, which means for that dim star a magnitude of 6.9. That dim star had sufficient signal to noise to be easily recognized in the image. Now consider if the image had been exposed, not for 1/4 second, but for 240 seconds like the hunt for Pluto was supposed to be. Then this exposure should have collected (240/0.25) = 960 times more light, which represents an enhancement in magnitude of 2.5 log(960) = 7.4. So, in theory, we should be able to see a dim object of 0.4 + 6.5 + 7.4 = 14.3 magnitude. This is great. Now there is still some room for error and improvement here because first of all the Betelgeuse signal was saturated, which means we should have more margin to see Pluto, and secondly since the camera and lens has not been calibrated for vignetting, etc, the actual performance could be more or less the same, we just don't know. Anyway, it seems clear that it is still worth trying. but the one below has a couple of other predicted locations for Pluto, which we will discuss shortly. Note that for many of the featured star trails, I have selected many star catalog stars, in the approximate same location along the star trail, on which the RA and Dec of the entire image can be calculated and the magnitude of the catalog stars can be looked up. 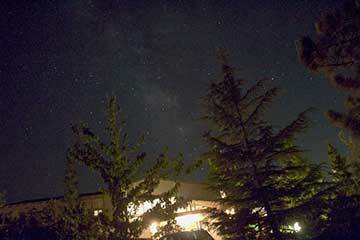 It turns out that most of these stars are in the magnitude 9 range, way short and brighter than magnitude 14.2. 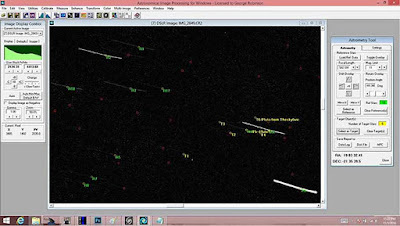 Now here is the key thing to notice and that is that many of the red circles, which represent catalog stars of magnitude 13 and dimmer and there is not associated star trails. So, it seems the image does not go deep enough to get even to magnitude 13. In a previous blog, we had noticed some strange white blobs in the image and these blobs were later traced to faint stars. If you don't remember all this history and want to see again how they were discovered and resolved then you can go to the September 12 post Click here for September 12 post and also see how the blobs were finally resolved to be faint stars in September 16 post Click here for September 16 post. But fainter stars probably don't show up because they have been smeared out by the poor tracking. If the tracking is corrected that should result in an improvement. Previously, the star trails were measured to be spread over a length of 340 pixels. If all of that light had been gathered into one pixel, or at least counted as coming from one object, an improvement in magnitude of 2.5 * log (340) = 6.3. So, this line of thought indicates possible measurement of objects as dim as 9.0 + 6.3 = 15.3, which is roughly the same as the other analysis path. So, in summary, I still think that I should be able to see faint Pluto with the telephoto, assuming that the tracking error can be resolved. This measurement has to be done in very dark skies, so we might have to arrange another visit to Borrego Springs, or perhaps the Candy Store location might be dark enough, but I don't think Black Star is dark enough and certainly here at the observatory is not dark enough. Darn, this lesson shows, just like the big professional astronomers, we learn how to improve and then have to schedule and get permission to travel to the dark sites to make the measurement. The other issue to resolve is now I keep finding different values for RA and Dec for Pluto, depending on the source consulted. What to do about this? Note in the screenshot, how T1 position from MICA is about 16 arc minutes away from http://theskylive.com/ position for Pluto. How to resolve this? Any ideas? This issue sort of came up when we were trying to capture images of asteroids and here it is again for planets. The RA and Dec do change on a daily basis by about a half dozen arc seconds, but why are the separate estimates so far apart? Finally, after all of that work, and since we need to schedule the next Pluto observing session, we should check out five new meetings of special interest to astronomers and physicist wannabes that are also competing for time on the calendar. The end of the year always gets busy anyway, so be sure to consider fitting in some of these upcoming meetings. So, that is about it for this time. We will miss the next OCA general meeting, astrophysics meeting and Black Star observing party. Resident Astronomer Peggy and I will be leaving in a couple of days for our Mediterranean cruise about the 950 passenger Viking Sea. 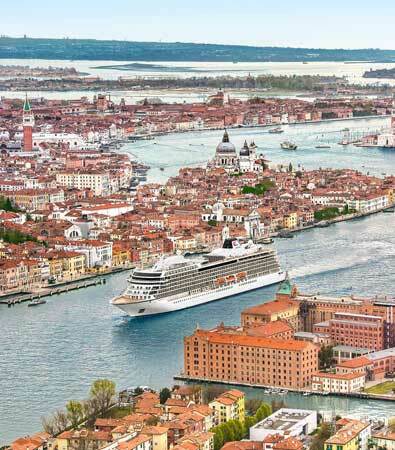 Their website shows the ship in Venice. As I've mentioned before, we are not taking any astronomical equipment, other than our eyeballs. It's not clear how to use a telescope at sea anyway. Yes, the skies on sea days should be pretty darn dark, but how do you mount and observe using a telescope from a moving ship. Any ideas? Anybody got a light weight gyro-stabilized mount or equivalent (that will go through airport security)? Our offsite observatory platform -- 950 passenger Viking Sea. Where does the telescope go?